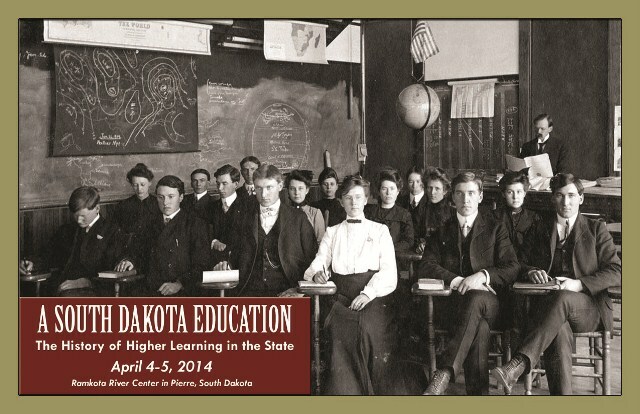 The History of Higher Education in South Dakota will be the theme of the 2014 South Dakota State Historical Society History Conference, to be held Friday and Saturday, April 4-5, at the Best Western Ramkota in Pierre. “A South Dakota Education: The History of Higher Learning in the State” will be hosted by the State Archives. Among the topics to be covered are the technical institutes in South Dakota, tribal colleges and universities, the role of university archives, intercollegiate athletics and rivalries, medical education in South Dakota, the arts and academia, and deep underground science in the Black Hills. Other confirmed speakers include Dr. Rodney Parry, Dan Genzler, Mike Henriksen, Brad Tennant, Dr. David Reynolds, J.D, Ackman, Tim Steele, Ben Sayler, Deb Shephard, Chris Paustian, Phil Baird, Cheryl Medearis, Dr. Laurel Vermillion, Patty Andersen, Laurie Langland, Robert Russell, and Tawa Ducheneaux. The Dominant 7, an ensemble from Northern State University in Aberdeen, will be performing during the Friday luncheon. The results of the annual election of the State Historical Society board of trustees and the winners of the Governor’s Awards for History will be announced during conference. Teacher certification renewal credit is available for conference attendance. Anyone is welcome to attend the conference, although State Historical Society members receive a discount. The early registration deadline is March 14; people can register after that, although it will cost an extra $10. Registration, conference schedule, speaker information and sponsors are found at history.sd.gov and linking to “History Conference 2014,” or by calling 605-773-6000. This program has been funded in part by the South Dakota Humanities Council. The South Dakota State Historical Society is a division of the Department of Tourism. The Department of Tourism is comprised of Tourism, the South Dakota Arts Council and the State Historical Society. The Department is led by Secretary James D. Hagen. The State Historical Society, an Affiliate of the Smithsonian Institution, is headquartered at the South Dakota Cultural Heritage Center in Pierre. The center houses the society’s world-class museum, the archives, and the historic preservation, publishing and administrative/development offices. Call (605) 773-3458 or visit www.history.sd.gov for more information. The society also has an archaeology office in Rapid City; call (605) 394-1936 for more information.